Rose Hut is a Shepherds hut hand built by craftsman to the highest standards. It is positioned with far reaching views across our lake to ancient woodlands. 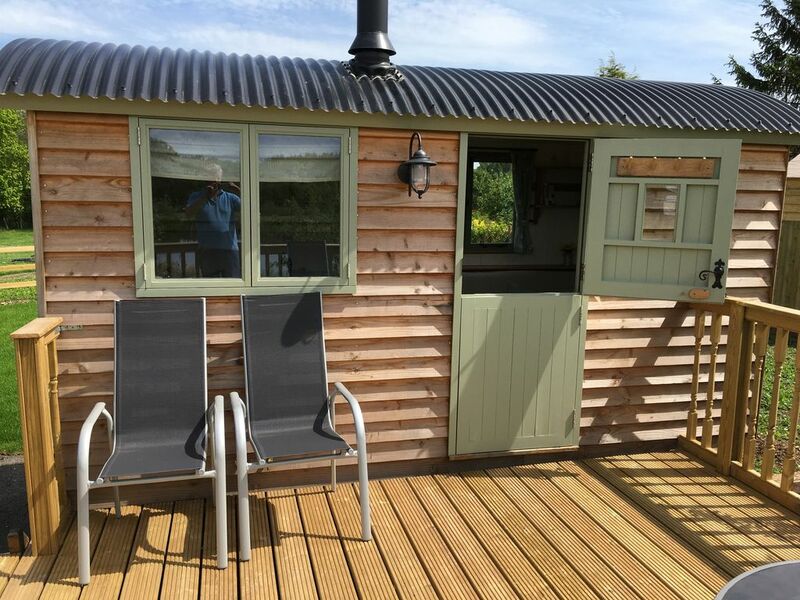 It provides a unique glamping experience in a high end hut with a new fully fitted shower room only 20 paces away, a large decked area to sit and watch the swallows feeding above the lake and a hot tub (shared) to relax at the end of a days exploring. The hut enjoys stunning views in a quiet rural location on small private estate, located centrally in Kent you are only a short drive from all of Kent's attractions and castles, with many bridleways and footpaths on the door step you can get away from it all and relax. The hut has an Oak foldaway dining table that seats 4, this folds away at night and converts to a double bed. The kitchen is also hand made in Oak with butler sink, 2 ring gas hob, small fridge and microwave. The kitchen bench seats convert to bunk beds for the children. The modern heated private bathroom is 20 steps away, fully tiled with power shower and extra storage for your belongings. My brother and I came to stay here as we grow up in the area 50 years ago. It's was a great location for visiting the place we wanted to see. Canterbury, Romney Hythe to Dymchurch railway and Lenham. The shepherds hut was as except, quiet and beautiful setting. We cooked our breakfast on the BBQ which added to the glamping experience. Fresh eggs from our hosts. We took full advantage of the hot tub with a glass of bubbly and enjoying the sun set. My brother slept in the pull up double bed and said he had no problems, was a comfortable night's sleep. We lite the wood burner both nights and where so warm we had to sleep with the windows open, but that was lovely. The only other thing that I would have liked to have found on our arrival, would have been a small welcome basket rather than other guests left overs. All in all a fabulous stay. over all the shepherds hut was lovely and a lovely location but the hot tub could of been cleaned as it had scum around the edges but apart from that it was a perfect little get away. Thank you for your review, we are very pleased that you enjoyed your stay in Rose Hut. We are sorry that the hot tub was not as it should be, the water is tested every day and chemicals added as appropriate. We do a 100% water change and full clean with change of filters every week. Occasionally you do get a build up of soapy suds from the washing powders in swimming costumes but we do add defamer to stop this so I can only assume not enough was applied that day. On top of my must go back to list. Thank you for staying with us .So glad you enjoyed the area and the hut.We would love to have you back again , so do keep us in mind for another trip if you come to kent again . Would highly recommend to anyone who wants somewhere peaceful and relaxing to stay for a couple of days. The views are stunning, the Shepard’s hut was cosy and welcoming, Wendy and Nigel were an absolute delight and the hot tub was an added bonus considering we had it all to ourselves. Honestly, if you’re thinking about a quiet and peaceful break away, book with these guys! We had a amazing stay in the Shepherds Hut in December . Inviting, beautiful and welcoming little cabin and hosts . We had a wonderful stay here. The location and grounds are beautiful. The hosts are friendly and welcoming. We will be sure to visit again. Thank you for a lovely review .We are so glad that you enjoyed your stay in The Shepherds Hut.We hope to see you again soon or maybe a summer trip to see us,a dip in the Hot tub and a look around the farm .Thank you for booking with us .